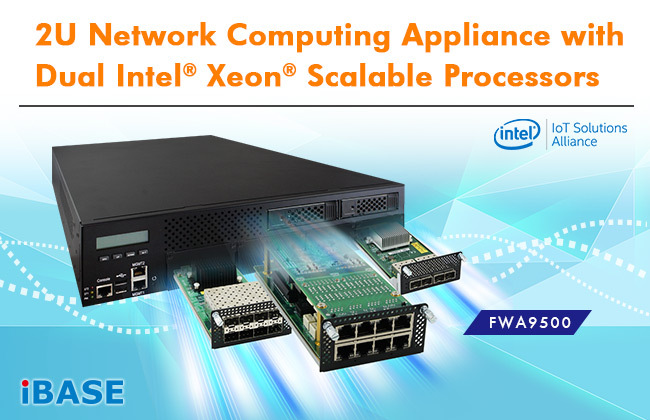 IBASE Technology has launched its flexible FWA9500 network computing appliance supporting Intel® Skylake-SP Xeon® processors for today’s ever-changing network environments. The 2U rackmount system features dual LGA3647 CPU sockets and the Intel C624 chipset that supports up to 512GB RDIMM memory in 16x DDR4-2666 sockets. With two Intel I210-AT Gigabit Ethernet controllers on board and configurable NIC module slots, it can be equipped with 8x IBN (IBASE proprietary network interface) cards to accommodate a maximum of 66 GbE ports. Designed to be an ideal workhorse for enterprise workloads to manage vast quantities of data, the FWA9500 enables robust levels of performance and reliability in enterprise-class network security, firewall, VPN, UTM, WAN and network management applications. The FWA9500 comes with I/O connectivity and expansion slots, such as a PCIe x8 slot, an M.2 (M-key), a Mini PCIe, two USB 2.0 and an RJ45 serial console with LCM display for easy operation. LAN bypass and the IBASE IDN100 IPMI 2.0 module are optional features.